Our sustainable formulation of these key plant based ingredients burns clean, naturally. Why buy our incense cones? Each cone contain 10% repellent oil content, which is a significant amount of repellent oils needed to create a pleasant bite-free environment. 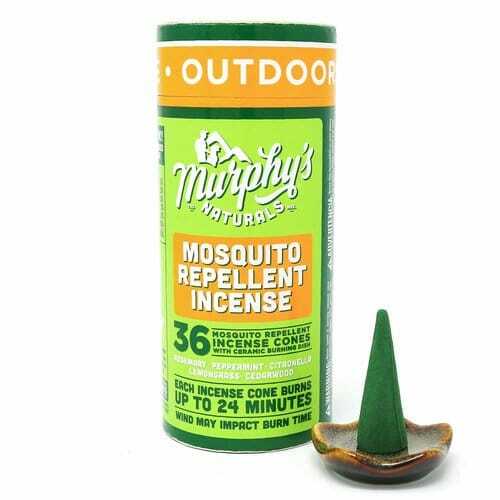 It’s infused with Citronella, Rosemary, Peppermint, Lemongrass, and Cedarwood oils. Plant based ingredients burns clean, naturally. Place an incense cone on the provided ceramic dish. Light the tip of the cone until the flame catches (about 15 seconds). Allow end to flame for 10-20 seconds, then carefully blow out. A wisp of natural incense repellent will come from the end of the cone. Ensure the incense cone does not touch things that may catch fire. The end of the burning incense cone and the ash is hot, see WARNING instructions. Never leave a burning incense cone unattended. Place incense cone so there is no danger of it lighting foliage or other things that catch fire. Keep children and pets away from the burning incense cone.